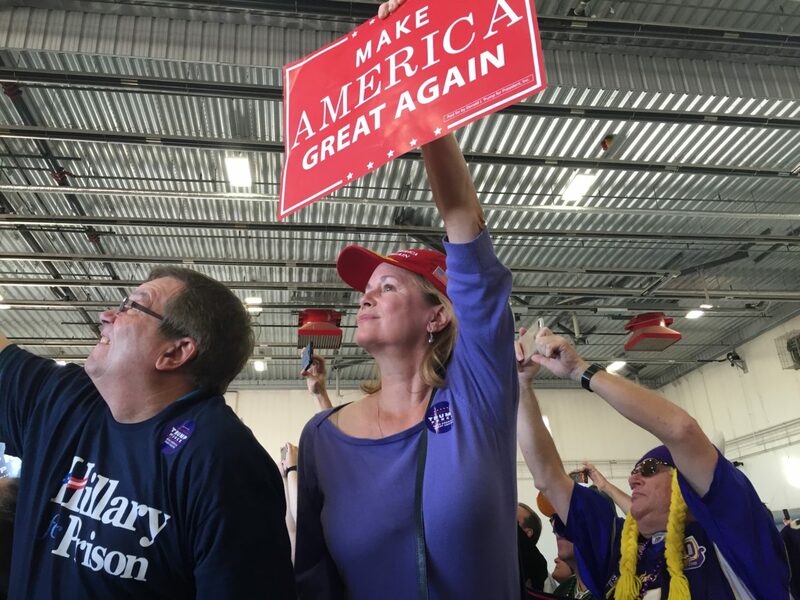 MINNEAPOLIS, Minnesota — Thousands of ecstatic Trump supporters packed an airplane hanger at Minneapolis International Airport as Donald Trump made his most daring bid yet to flip a “blue” state to the Republican column. According to police, 5,000 people were allowed inside the hangar, but 17,000 had reserved for the event. Thousands gathered outside the fence — and more on the far opposite side of the airport, observing the event from a great distance, atop a dirt hill. 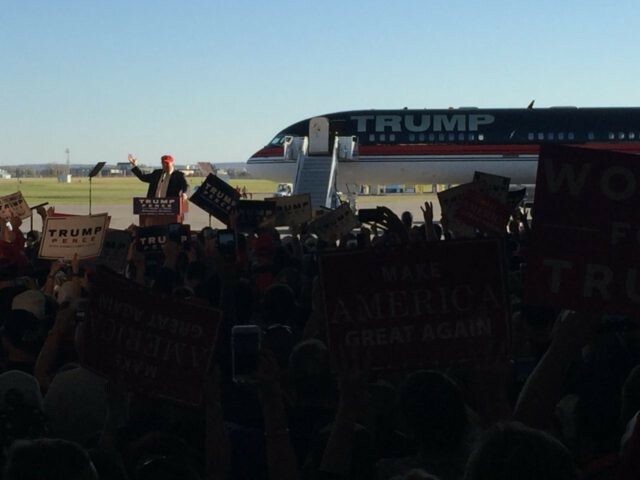 Trump arrived in his trademark style, landing in his private plane and taxiing to a halt directly in front of the crowd. To the sound of “God Bless the U.S.A.,” he descended the stairway and waved to the crowd from the stage. People had told him, he said, not to visit Minnesota. “I took all kinds of heat,” he told the audience. But, he said, “I love Minnesota!” And he told the audience that this election would be their best chance to achieve change in America. In four years, he said, it could be too late, because Democrats would have taken firm control of the Supreme Court. 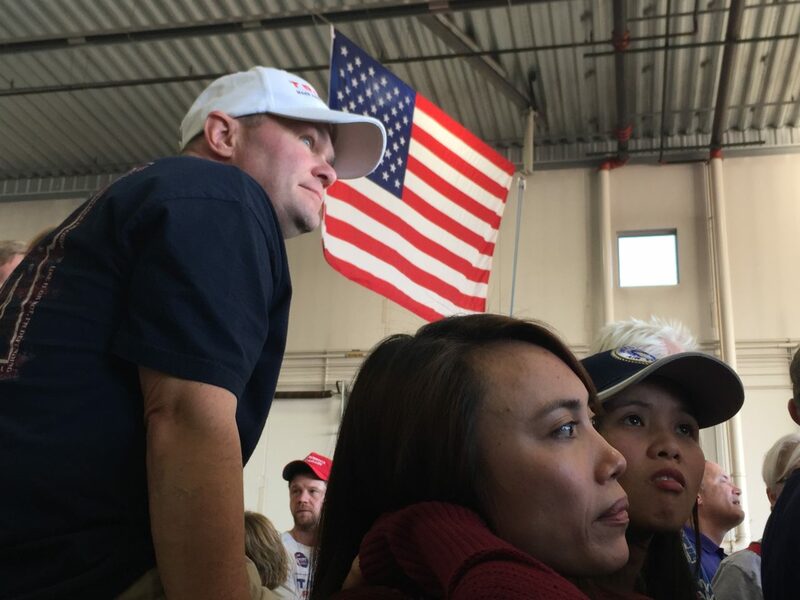 But the echo in the hangar was near-deafening, with most ordinary sounds — even Trump’s remarks from the front — drowned out by cheers. “Why do I feel good about Minnesota?” he asked, to a roar. Trump addressed the topic of Syrian refugees, in a state where a burgeoning immigrant population from the Middle East has included a small minority of radicals, some of whom have gone on to fight with terrorist groups against the United States. Fans inside were enthusiastic, and optimistic. 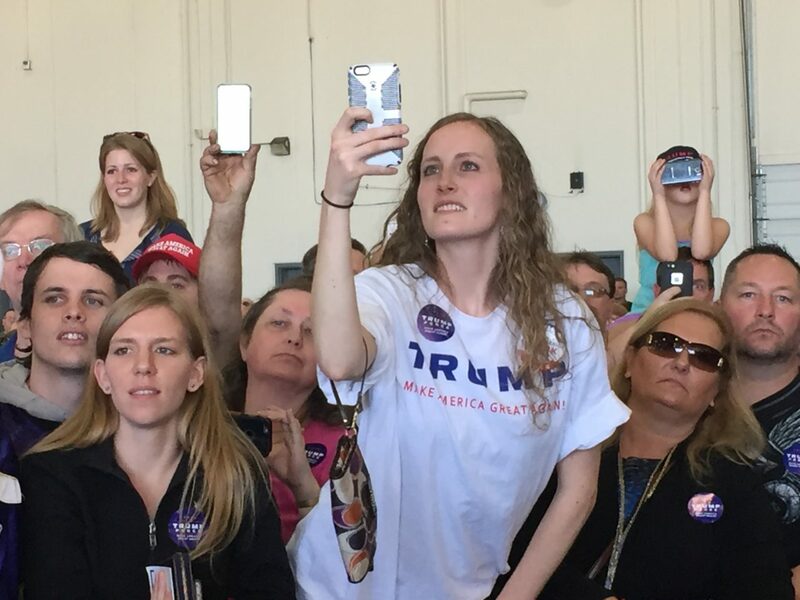 Melissa Buege, of nearby Woodbury, told Breitbart News that she was at the rally “to show support for Trump, to support my country, and to show my concern about the way we are headed. 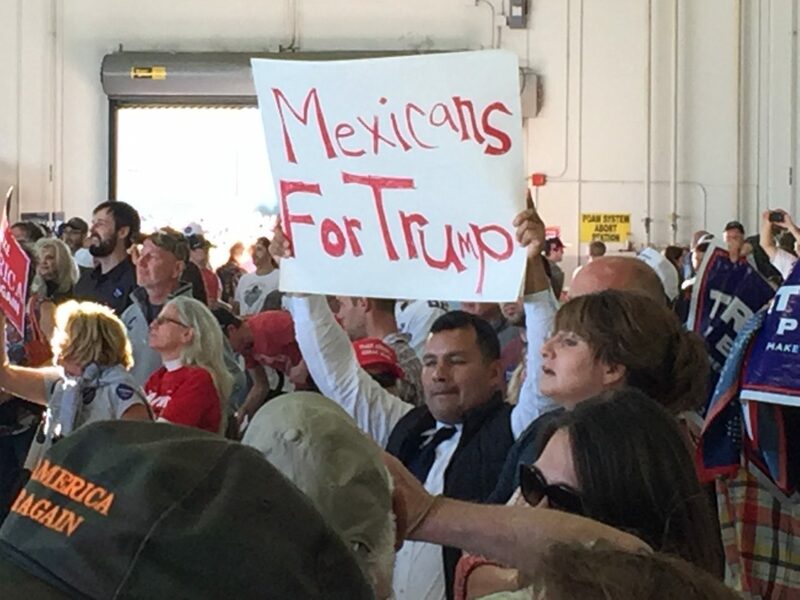 Mike Kulhanek, 44, of Empire, Minnesota, held up a homemade “Mexicans for Trump” sign. “I’m a a second-generation legal immigrant,” he said. “We need to have strong borders, for both Americans and for Mexicans. Estelle Senopole, from Oakdale, Minnesota, said that she supported Trump because she is pro-life. And, she added: “The opposite of control is freedom. Trump is going to return control to the people, and give us freedom again, so we can flourish. “I don’t think anyone else could have done what he has done — to face all of the tough stuff and not quit. “The other side are the deplorables — we’re the adorables,” she concluded with a smile. Minnesota has 10 Electoral College votes, and has not voted for a Republican in a presidential election since 1972. It's great to be back in Minnesota today. It was so important for me to come here again and campaign for your vote, I've been here many times before -- Hillary doesn't even bother to come here. She refuses to campaign in Minnesota. Do you really want a President who doesn't care about your vote? I am asking for the support of every voter in this state – Democrat, Republican, Independent and first-time voters – who want to take our government back from the Corrupt Political Class in Washington, D.C.
I’m asking for the votes of students, parents, retired Americans, union workers, African- Americans, Hispanic- Americans, and all Americans who are tired of a government that works for Wall Street but not THE PEOPLE. It is time for all Americans to UNITE and take back our government. I’m very honored to have won the mock vote of High School Students in Minnesota – this election is all about creating a better future for our children. Our failed establishment has brought us nothing but poverty at home, and disaster overseas. We are tired of economic and foreign policies that have BLED THIS COUNTRY DRY. It is time for REAL CHANGE that puts the people back in charge. This election will decide who runs this country: the Corrupt Political Class – or YOU, the American People. That’s the choice. She’s with THEM – I’m with YOU. This is our last chance. In 2 days, we are going to win the Great State of Minnesota and we are going to win back the White House. It’s just been announced that the residents of Minnesota are going to experience close to a 60% increase in premiums. Every single county in Minnesota is losing an Obamacare insurer next year. I’m asking for your vote so we can repeal and replace Obamacare and save healthcare for every family in Minnesota. Hillary Clinton will be under investigation for a long time for her many crimes against our nation, our people, and our Democracy -- and likely concluding in a criminal trial. She is the most corrupt person ever to seek the Presidency of the United States. My Contract With The American Voter begins with a plan to end government corruption – and to take our country back from the special interests. I want the entire corrupt Washington establishment to hear the words we are all about to say. When we win on November 8th, We Are Going To DRAIN THE SWAMP. America has lost one-third of its manufacturing jobs since NAFTA – a deal signed by Bill Clinton and supported by Hillary Clinton. America has lost 70,000 factories since China entered the World Trade Organization – another Bill and Hillary-backed disaster. Minnesota ranks fourth nation-wide for the highest share of jobs lost due to our trade deficit with China. And when Hillary was Secretary of State, our trade deficit with China grew 40 percent. - Ford laid off 794 workers in Saint Paul and moved their jobs overseas. - Moneygram laid off 408 workers in Brooklyn Center and moved their jobs overseas. - Greatbatch laid off 200 workers in Plymouth and moved their jobs to Mexico. - Smead Manufacturing laid off 592 people in Hastings and moved their jobs to Mexico. - IBM laid off 500 workers in Minneapolis and moved their jobs to India and other countries. A Trump Administration will stop the jobs from leaving America, and we will stop the jobs from leaving Minnesota. If a company wants to leave Minnesota, fire their workers, and move to another country, and then ship their products back into the United States, we will make them pay a 35 percent tax. We will also unleash American energy – including shale, oil, natural gas and clean coal. We will also cancel all harmful Obama regulations that hurt Minnesota farmers, workers and small businesses. But to be a rich nation, we must also be a safe nation. Hillary wants a 550% increase in Syrian Refugees pouring into our country and she wants virtually unlimited immigration and refugee admissions from the most dangerous regions of the world. Her plan will import generations of terrorism, extremism and radicalism into your schools and communities. Here, in Minnesota, you’ve seen firsthand the problems caused with faulty refugee vetting – with large numbers of Somali Refugees coming into your state without your knowledge, support or approval and with some then joining ISIS and spreading their extremist views. You’ve seen the recent terrorist knife attack in St. Cloud. A Trump Administration will not admit any refugees without the support of the local community where they are being placed. And we will pause admissions from terror-prone regions until a full security assessment has been performed, and until proven vetting mechanisms have been established. A Trump Administration will also secure and defend the borders of the United States. And yes, we will build a great wall. Hillary supports totally “open borders,” and strongly supports Sanctuary Cities, like San Francisco, where Kate Steinle was murdered by an illegal immigrant deported 5 times. Thousands of Americans would be alive today if not for the open border policies of Obama-Clinton. There is the tragic case of 90-year-old Earl Olander, a Minnesota Farmer, who was brutally beaten by illegal immigrants and left to bleed to death in his home. Earl’s body was found with his hands bound behind his back in duct tape, and blunt-force injuries to his head. His killers had criminal records, but they did not meet the Obama Administration’s priorities for removal. A Trump Administration will end this nightmare of violence. We will stop illegal immigration, deport all criminal aliens, and dismantle every last criminal gang and cartel threatening our citizens. I’m honored to have the endorsement of more than 200 top Admirals and Generals and 22 Medal of Honor Recipients. Hillary and our failed Establishment have spent $6 trillion dollars on wars in the Middle East, and now it’s in worse shape than ever before. They’ve dragged us into foreign wars that have made us less safe, shipped our jobs and wealth to other countries, and left our borders wide open at home. We send our troops to foreign countries to defend THEIR borders, but our politicians refuse to defend OUR borders. That will change on November 8th. A Trump Administration will never, ever put the interests of a foreign country before the interests of our country. From now on, it’s going to be AMERICA FIRST. To all Americans I say: it is time for change. It is time for New Leadership. We are going to have the biggest tax cut since Ronald Reagan; we will save and protect your Social Security and Medicare – Hillary Clinton will reduce and cut your Social Security and Medicare benefits; eliminate every unnecessary job-killing regulation; cancel every illegal Obama executive order; protect religious liberty; rebuild our military and take care of our Vets; provide school choice and put an end to common core; support the men and women of law enforcement; save the 2nd amendment; and appoint Justices to the Supreme Court who will uphold and defend the Constitution of the United States. It is time to cut our ties with the failed politicians of the past. Hillary Clinton is the candidate of yesterday. We are the movement of the future. We are fighting for every parent who lost their child to drugs and crime and gang violence. We are fighting for every community whose jobs and dreams have been ripped out and shipped to other countries. We are fighting for every American who believes government should serve the people – not the donors, and not the special interests. I’m asking you to Dream Big – because with your vote, we are just 2 days away from the change you’ve been waiting for your entire life.